You don't start mopping, until you've stopped the leak/turned off the tap. Best (current) tactic will be to swap 'more polluting' for 'less polluting/damaging'. Nat. Gas is better, but not great. Nuclear is "clean-running", but has that 'what do we do with the waste' problem. Hydro is really clean, but to create one, you're probably flooding out an area - habitat destruction. Solar - needs sunlight :), almost the perfect choice - we have an incredible amount of 'wasted space' that this could make use of: roofs! I would love to see every roof turned into a solar-capture structure. This tech has been getting better, and better, in efficiency. Tidal - limited useful locations, I hear there are a few in Scotland. Geothermal, but that's even more location-limited than Tidal. Fusion, which is only a decade away. And has been for three decades now. One of these decades, it really will be a decade away... possibly soon enough, maybe, we'll see. Maybe. I doubt I'll be alive to see it but maybe you will. Image no worky. But we have high technology levels so its probably OK.
Lockheed Martin was quoted on having a small fusion reactor within 5 years. There are teams from Germany, and South Korea that are making significant developments in fusion. So I don't think fusion is far off. 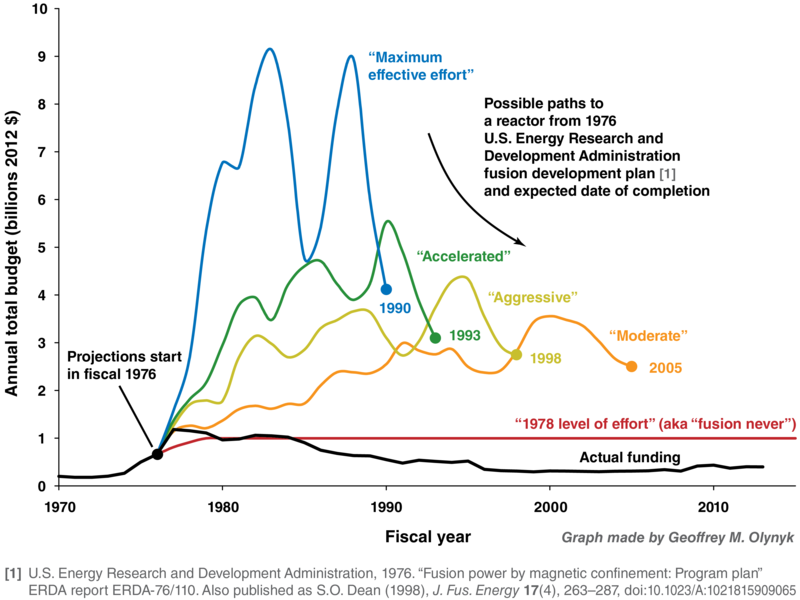 The scale and cost won't be ideal but once fusion is here, its only a matter of time till those are addressed. ah fusion, the energy equivalent of the singularity discussion. Human ingenuity will push through and then every thing will be tots okay forever! thermodynamics be damned! 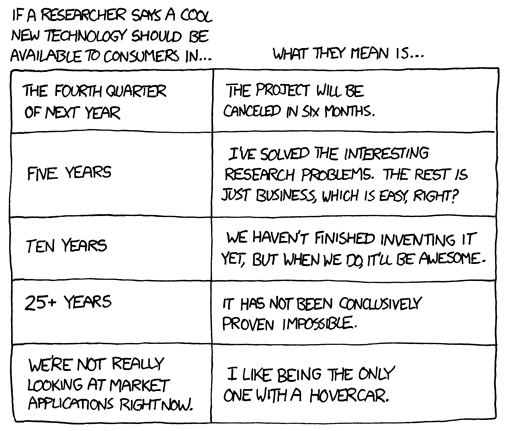 eta: also given Trump's win and desire to return to coal en masse in the US that xkcd comic 'current path' should probably be a fair bit worse. Fusion doesn't break thermodynamics, which is why the sun works. Indeed, I was more thinking of the claimed and hypothetical devices lay persons come up with, which more often than not could only ever work by violating the laws of thermodynamics. Assuming that Lockheed do indeed have a functioning small experimental reactor in 5 years, very optimistically, that's another 5-10 years for them to iron out the wrinkles to get a product that can be marketed, another 10 to scale it up to industrial plant sizes, and another 20 years for it to percolate through the energy industry. 40 years from now is too late. Because when you add the 30-50 year lag that the climate operates on (i.e. if we stopped emitting ALL carbon now, it would 30 years before you'd see the climate start to swing back in the other direction), you're basically saying "nah, let's sit on our hands for 70 years, and it'll be fiiiiine." At this point I honestly think Fusion will be too late to be a big power source. By the time it becomes economical I suspect that solar power will be so cheap and already have a huge installation base (ie, on the roof of all large buildings, over parking lots, on most suitable homes) so that very little of our power needs will actually still need to be filled. It may take up that 15-20% base that we need as a foundation for the less constant renewable energy, the high and low latitudes may use it more, and then space travel once we can miniaturize it, but I no longer think that Earth's future is a predominantly fusion powered one. The good news is that we're great at finding new ways to use electricity. That's very true, but Solar power has a lot of untapped capacity (even if you only limit it to already developed areas, rather than bulldozing wilderness for new panels). I'm also expecting global GDP and global energy use to continue to diverge more and more, as more and more of global gdp moves to producing things in the virtual world rather than physical products, which is an area that seems to see much more efficiency increases than the creation and transport of physical goods. If that's not true then we're a lot more likely to see widespread fusion power before the 22nd century. The problem with solar isn't the technology, although that does keep getting better. It is simply politics, greed and capitalism. I had someone from Solar City come out to do an install estimate this year. If I wanted to pull my house completely off the grid (requiring batteries), I would be charged a fee of at least hundreds if not thousands of dollars for the power company to come out and remove the meter and equipment. If I want to stay connected to the grid, I can only install a system that can generate ~95% of what my average usage was for the past 12 months. It doesn't matter if I have the space/money for a bigger system - it is just not allowed. Being that my system can only generate my average usage, that guarantees I will still be drawing power sometimes from the grid. And I would still be charged $25 or more per month even if I don't use a single electron of grid power. The only way it would make sense is to switch to using electrical everything for the next 12 months, then get solar, then cut back on my electrical usage. It is worse other states. I forget the details, but laws were passed in Nevada that makes installing solar pretty much useless. With the current administration already committing to more oil/coal/gas production, it is unlikely we'll see a coordinated push for green technologies any time soon. There are actually a few states where there are laws on the books that allow power companies to charge YOU for the electricity you generate but do not store locally (with the batteries) or use... which other customers can use (because it's going back into the grid) and the power company also charges them for. Well, it takes a ton of money to build power plants, and states and regions have to contract with them to deliver the power, and then bid on it. The current transmission and power sales system is not geared to millions of individual producers, and if they put electricity on the grid in large amounts, larger producers could be forced to idle assets they have not yet paid off in response. Further, the regional nature of this lends itself to fractured market rules, and the physical infrastructure makes long-range power delivery impractical, especially in an on-demand way. We need to remake the electrical infrastructure *and* the market rules to reflect the new reality that anyone can be a producer as well as a consumer, and the market should be national rather than regional. It should also not privilege the large power providers, who already have a dominant position. This is an *enormous* political and technological task; it's going to take a while even with a compliant Congress. With a resistant regime, well, the system is likely not to change, even though it's one of the top priorities for infrastructure refresh. If I want to stay connected to the grid, I can only install a system that can generate ~95% of what my average usage was for the past 12 months. It doesn't matter if I have the space/money for a bigger system - it is just not allowed. If you don't pay your power bill they shut off your power. So at that point, what can they do? Even if the meter is there, it is inactive. Then you just need to disconnect your breaker from the mainline and connect it to your batteries. Why do they even have to know? That's for the "no batteries" solution. Until the grid has far, far less always available carbon power built in to it, the optimal and cheapest solution for a homeowner (that is not worried about storms or whatnot knocking out their power) is to get solar panels and stay on the grid, which is the situation these rules are trying to penalize. It's hard to say to what extent those fees represent anti-competitive interests getting their way, and how much they represent actual reasonable remuneration for services. For example, the $25 minimum monthly bill seems reasonable, there is still cost to them to handle your power. The arbitrary limit to the installed amount seems a little less reasonable, but maybe there are still technical reasons for that. $25 a month from every person on the street seems like a lot to me. I can't remember the last time I saw an electrical truck on my street fixing something. I'm no engineer, but I would guess that the grid should not need much maintenance: storm-related damage, the occasional pole replacement, or a blown transformer. There are 8000 people in my town alone - does it really cost $200k a month to maintain the grid? As for the technical reasons for the limitation, I can see where getting the power from 8000 sources instead of just one would be more complicated. If it's sunny and they're all generating power, it has to go somewhere. And if a storm system comes through, they have to provide the power from somewhere. I think someone mentioned this above, but that's where a national grid would make more sense - it's always sunny somewhere. Plus, there are plenty of efficient, non-battery ways to store power for those non-sunny days too. So, the electric company could become an energy storage provider rather than just an energy generator. The problem is - as usual - capitalist economics. All of those electric companies are publicly traded, and it would be a bloodbath if the government one day mandates that we can install all the solar we want - their profits would tank. No argument with the other things, but power doesn't transmit well over long distances. It can be done, but the losses get pretty heavy. Lots of small markets might be much more efficient. Dang. I thought that problem had been solved. Well, I'm not a special expert, so you might have seen something I missed. As far as I know, barring superconductors, transmitting power over long distances always involves quite a bit of loss. That decreases with high voltages, which is why the big transmission towers run so hot, but the farther you go, the less power gets to the other end. I think the only way to solve that problem would be by using wires without resistance, and superconductors are one of those holy grail tech advances. True, and you do gain from centralizing those resources to some degree, but the farther they are from where the power is used, the less efficient the storage becomes. Malor is overstating transmission losses significantly. In the US power grids those losses are less than 7%. However it should be noted that a shift to more and more renewable power is likely to increase that number unless it comes with corresponding infrastructure upgrades, since it's likely that that shift will overall increase the distance of suppliers and consumers. Right now our renewable generation is a small enough amount that such concerns are negligible. I live in eastern PA and buy my power from wind farms in the Midwest. Think of the power in the grid like a big pool, with hoses pouring in and out all throughout it. The fact that the water molecules my house pumps out are mostly coming from the inflow near me doesn't matter, I can pay the guy pouring water into the deep end for providing my water even though I live closer to the shallow end, and it will all work out. But right now that is helped along by the fact that we do have inflow hoses all over the place. One of the possible issues with renewable energy is that some of the country doesn't have really good places for solar or wind power close to them, so if we got to the point where that power was, say, 60% of the grid, those transmission costs would start to increase. I'm not super concerned with this, like I sourced, those transmission costs are surmountable, even if we end up having to build a 9% power surplus instead of a 6.5% surplus from renewable sources that's doable. You can also improve things by increasing high-voltage transmission line coverage from the new supply areas to the demand areas. It also may be better to just put more solar panels in places like PA, even if they aren't as effective as those in Arizona. It also may figure into placement of the base generation systems you'll have (unless energy storage prices drop more than I'm expecting). A perfectly non-CO2 system would still have some amount of natural gas capacity from burning (primarily food) waste, those will be near the population centers making the waste, so that already helps (the best modern way to do this is have everyone throw out their food waste via a garbage disposal. A suitable water treatment plant can then syphon off the methane and other burnable products relatively easily) and then you'd probably use Nuclear to fill in the gaps. Although if we get better at building those salt towers that produce solar power throughout the night so that they aren't as much of an issue for airplanes maybe we can go nearly 100% solar, who knows. But moving past that logical fallacy, yes, the grid does need a lot of maintenance. Components are lifed, and they fail. Let's say that you have a lightpole transformer that has a life of 100,000 hours. Great! That's good for 11 years, right? Sure, but what about the other 10,000 of them in the city? Yup, two of those are going to fail every day, on average (but they won't, because a smart power company is going to replace them before they fail, which of course, means you're replacing them more often). But whatever, transformers aren't *that* expensive, are they? Indeed, now let's consider the other tens of thousands of components in your town's power system, most of which, you'll note, are not on your street, so you won't see the trucks fixing them. Sure, but you know what is expensive? Building hydroelectric dams and oil-fired power stations. Also expensive, running them, that's gonna cost you somewhere in the $1k-$5k / night, just to run it. To finish off, consider how often your power goes out. Rarely, right? Why is that? Either because the power company is sh*t-hot at fixing things before they break, or because they've built up multiple layers of redundancy so that when things do break, the grid stays up. More redundancy means more hardware means more maintenance. And even then, when your power does go out, how long does it stay out for? A handful of hours? Why? Because the power company has a fleet of maintenance crews primed 24/7 that can be diverted from scheduled maintenance and scrambled to deal with fixing nasty surprises. What you're saying about maintenance/service is true but what if the local power company is making a high profit that is growing every year? What if they've averaged an increase of 10% in price per year for the last few years and have already announced prices increases for the next 3 years? And to top it off you can pretty much count on an outage with any windy storm? This is a regional thing and depends on how well the local utility is organized and run.